Dog parks are about community and bringing owners and dogs together. From Miller’s Canine Playground in St. Charles to Lake Chase in Owatonna to Prairie Island Dog Park in Winona, southeast Minnesota is fortunate to have many parks where pooches and their people can romp and play. Dog parks are not for every pup, though. Some owners swear by parks while others won’t step a paw inside. 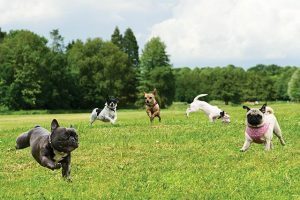 Dog parks offer an opportunity to socialize and exercise your dog, but one poorly managed situation can escalate into a fight that can scar both physically and mentally. Sharing of illness among four-legged friends is another concern. How can a responsible owner minimize the risk and maximize the fun? Consider the biggest hazard at a dog park may not be the dogs—but the humans. Avoiding these human mistakes will help make dog parks safe and fun for everyone (furry or not). It’s simply good manners to scoop the poop. Not only is it gross to come upon…leavings, diseases and parasites can pass between dogs via poo. Bonus points for bringing extra bags to help out another owner; we’ve all been caught without at some point. Recall is about your dog being attuned to you and coming when you call, every time. Even in the midst of a fun game of chase, the “zoomies,” or an escalating situation, your dog must come when called. No recall skills, no dog park. It may seem safer to keep a leash on for better control. During play, however, a dog on a leash is a tripping hazard for you, other owners and other dogs. A dog may feel insecure because she knows she can’t easily escape a situation should she feel the need to do so. This can increase anxiety and even trigger a fight that otherwise may have been avoided. Retractable leads are even more dangerous. An excited dog can race away thinking she has full freedom only to be unexpectedly snapped back at the neck. Let your dog get her fun on with her leash off. For dogs that are already well-socialized, a dog park is a great place to meet and greet four-legged friends. A dog park is not the place for dogs working through fear or aggression issues. Dog-aggressive and fearful dogs need a calm, quiet and controlled atmosphere to meet and learn proper dog behavior. Putting an aggressive or fearful animal in the middle of a stimulating atmosphere like a dog park is simply dangerous. Leaving dogs to work through a bit of doggie drama is not a good idea. If things aren’t going well, it is the owner’s responsibility to intervene and separate the dogs. “A lot of owners don’t even realize their pet is displaying dominance type behaviors and making other dogs and owners uncomfortable,” says Kevin McClure of Leashes and Leads in Rochester. Look for mounting or aggressive nipping at another dog’s neck versus a play bow or a tag-and-run request. If a dog is giving or receiving aggressive advances, it’s time to stop the interaction by recalling your dog. Ignore the warning of rude, aggressive play and you’ll likely be rewarded with a dog fight. bullied or torturing another kid (or dog). Put the phone away (but don’t forget to post that pic of your adorable pup later)!